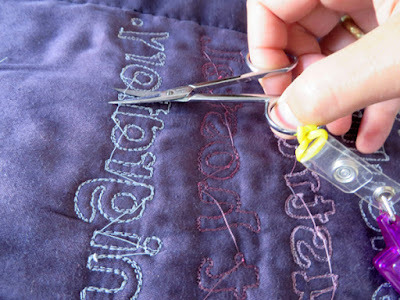 Uta Lenk - justquilts: To leave or not to leave...? I'm voting 'In' and so are many of my friends but there's people I know and respect who are voting to leave and a lot of undecided - it's very worrying. Whatever happens things will never be the same again. You're absolutely right, Margaret - now it's happened and everybody is shocked. And it will never be the same again. I am completely flabbergasted this could happen. What a stupid stupid vote. I don't think those who voted 'out' even considered all the nasty things that will happen now. What a sad sad day today. I used to be obsessive about thread ends on the backs of my quilts. Not any more. Who sees the back??? Not the jurors, not the judges (unless you're entering a traditional show), not the viewers. Why bother? I guess it's because this one is going to Birmingham, and the jurors' comments are vicious there. I never bother about threads that go inside the quilt, but I kind of like to have the back looking nice - unless it's meant to be thready. But then I let them show on the front, really. And I am doing that more and more.